Adam Richman has been here, Rachel Ray has featured the area at least twice, and Guy Fieri finally visited in 2018 and vowed to return. For a small city, Little Rock has a great restaurant scene, and these celebrity chefs visited some of the area's better restaurants. The Mean Pig is located in Cabot but was featured on "Man v. Food." Adam Richman went for the Shut Up Juice. You can purchase it online, but you have to agree "I understand this hot sauce is not diluted. I understand this hot sauce should be kept away from children, pets, and those with heart and/or respiratory problems and those adverse to hot foods." Aside from having super hot sauce, they also have pretty good BBQ. Rachel Ray visited Loca Luna, and it's been featured in publications such as Southern Living magazine. It features a funky, upscale Southern menu that includes some great cheese dip (an Arkansas specialty), pizzas, fried chicken, and more. 42 Bar and Table is located in the Clinton Presidential Museum. Surprisingly, both to most tourists and Rachel Ray, the museum's restaurant serves some excellent upscale food. You can eat the restaurant without paying admission to the Clinton Museum, but you might as well see the museum while you're there. The Faded Rose serves New Orleans inspired foods. Rachel Ray raved about its thinfish, which is thinly cut catfish fillets that have been breaded and deep fried. It also has shrimp and grits, etouffee, red beans and rice, and other Cajun dishes. Rachel Ray visited Stickyz Rock-n-Roll Chicken Shack for the atmosphere, but she stayed for the chicken fingers. There is live music at Stickyz almost every night. The food is pretty good for bar food, too. Besides the chicken fingers, it has pizza, salads, sandwiches, and even flapjacks. Rachel Ray headed back to Little Rock for a special BBQ episode of "Tasty Travels" when she stopped at Whole Hog Cafe. Whole Hog is a favorite local BBQ place, serving Memphis style wet BBQ ribs, sandwiches, and fixings. It has three locations around the city. Most "best of" Little Rock restaurants feature Brave New Restaurant, and Rachel Ray mentioned it when she did her "Tasty Travels" show. It is known for featuring the finest, fresh ingredients and having a great view of the Arkansas River. Rachel Ray mentioned Damgoode pies, but she didn't eat there on "Tasty Travels." It has one of the best pizza pies in Little Rock. The hand-tossed crust and unique toppings make it a must try. Check out one of their three locations throughout the city. Rachel Ray mentioned Homer's, though she did not eat there on her show "Tasty Travels." Homer's offers homestyle food at breakfast and lunch. It has specials such as meatloaf, fried chicken, burgers, and sandwiches. There are two locations in the area. This restaurant was featured on Rachel Ray's "Tasty Travels," mostly because Bill Clinton used to frequent it when he lived here. 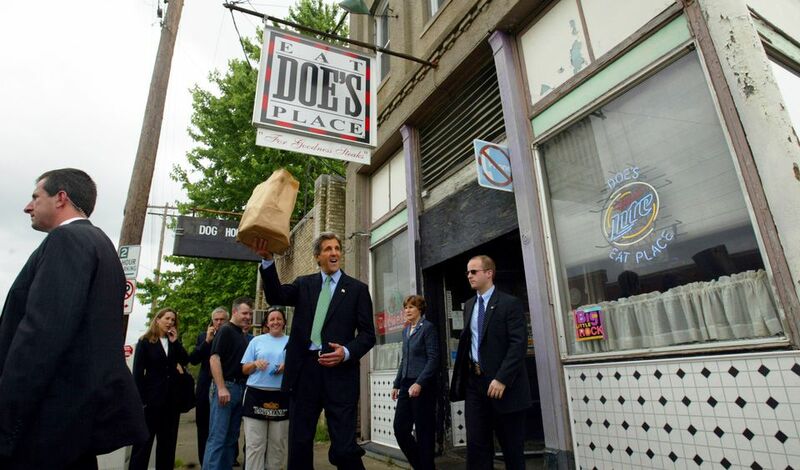 Clinton knew good food, though (this was before he was health conscious), and Doe's does have good BBQ. It's actually a favorite place for local politicians.